LAS VEGAS – The Culinary and Bartenders Unions and MGM Resorts International are pleased to announce that they have reached a tentative agreement for a new five-year contract covering 24,000 of the company’s employees at 10 casino resorts in Las Vegas. The contract includes groundbreaking language on worker security regarding sexual harassment, workload, technology, and immigration. As standard practice, specific details of the contract are withheld at this time out of respect for workers who have not yet had the opportunity to get the full details of their new contract and vote to accept. A ratification vote by the membership will be scheduled soon and more details will be announced after ratification. 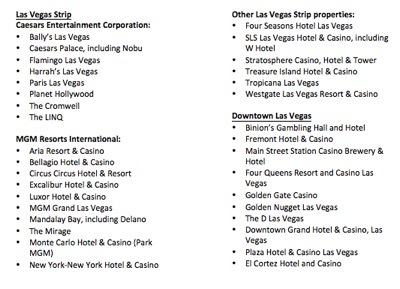 The new five-year contract covers the following Las Vegas MGM Resorts International casino resorts: ARIA, Bellagio, Circus Circus, Excalibur, Luxor, MGM Grand, Mandalay Bay (including Delano), The Mirage, New York-New York, and Park MGM. Culinary Workers Union Local 226 and Bartenders Union Local 165, Nevada affiliates of UNITE HERE, represent over 57,000 workers in Las Vegas and Reno, including at most of the casino resorts on the Las Vegas Strip and in Downtown Las Vegas. UNITE HERE represents 270,000 workers in gaming, hotel, and food service industries in North America. The Culinary Union, through the Culinary Health Fund, is one of the largest healthcare consumers in the state. The Culinary Health Fund is sponsored by the Culinary Union and Las Vegas-area employers. It provides health insurance coverage for over 143,000 Nevadans, the Culinary Union’s members and their dependents. The Culinary Union is Nevada’s largest immigrant organization with over 57,000 members - a diverse membership that is approximately 55% women and 54% Latino. Members - who work as guest room attendants, bartenders, cocktail and food servers, porters, bellmen, cooks, and kitchen workers - come from 173 countries and speak over 40 different languages. The Culinary Union has been fighting for fair wages, job security, and good health benefits for working men and women in Nevada for 83 years. Las Vegas, NV – Culinary Union and Bartenders Union and Caesars Entertainment Corporation are pleased to announce that they have reached a tentative agreement for a new five-year contract covering 12,000 of the company’s employees in Las Vegas. The historic new agreement includes groundbreaking language on worker security regarding sexual harassment, workload, technology, and immigration. As standard practice, specific details of the contract are withheld at this time out of respect for workers who have not yet had the opportunity to get the full details of their new contract and vote to accept. A ratification vote by the membership will be scheduled very soon and more details will be announced after ratification. 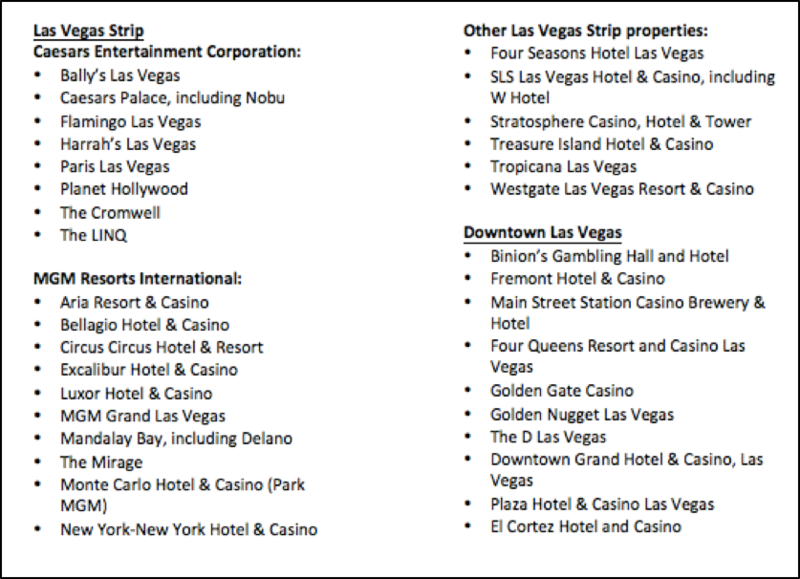 The new five-year contract covers the following Las Vegas Caesars Entertainment Corporation casino resorts: Bally’s, Flamingo, Harrah’s, Paris, Planet Hollywood, Cromwell, The LINQ, Caesars Palace (including Nobu), and the Rio. WHAT: Culinary Union opens “Strike HQ” as contracts for tens of thousands of workers have expired as of midnight May 31, 2018. 34 casino resorts are now operating without settled union contracts and hospitality workers are preparing for a citywide strike. Workers will be painting the “Strike HQ” and making thousands of strike picket signs. WHO: Culinary and Bartenders Unions members. Secretary-Treasurer for the Culinary Union, Geoconda Argüello-Kline. WHEN & WHERE: Friday, June 1, 2018 from 10am-12pm. The “Strike HQ” building is in the adjacent lot next to the Culinary Union (1630 South Commerce Street Las Vegas, Nevada 89102). Union contracts covering 50,000 union workers expired midnight May 31, 2018 at 34 casino resorts on the Las Vegas Strip and Downtown Las Vegas, including properties operated by MGM Resorts International, Caesars Entertainment Corporation, Penn National, Golden Entertainment, Boyd Gaming, and other companies. New investor alerts from UNITE HERE Gaming Research, the research arm of the hospitality workers’ union, project that a one-month strike in Las Vegas could cost the two largest employers on the Las Vegas Strip – MGM Resorts International (NYSE: MGM) and Caesars Entertainment Corporation (NASDAQ: CZR) – over $300 million in operating profits. In a survey conducted by the Culinary and Bartender Unions in the last two months of over 10,000 Las Vegas casino workers: 59% of cocktail servers and 27% of hotel housekeepers said they had been sexually harassed by guests, managers, or others while on the job. 72% of cocktail servers and 53% of hotel housekeepers said a guest had done something to make them feel uncomfortable or unsafe. The results of the survey and worker concerns led the Culinary and Bartenders Unions to propose stronger safety protections in current contract negotiations for workers. 25,000 workers voted by 99% on May 22 to authorize a strike after contracts expired. Workers can walk out anytime the Culinary Union calls for a strike. 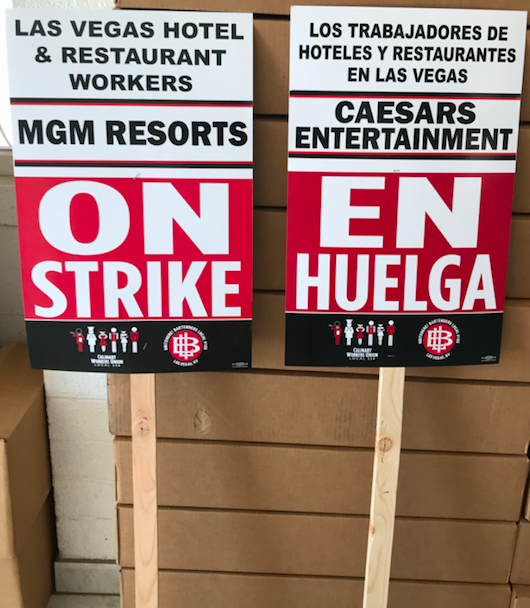 Members of the Culinary and Bartenders Unions who will be participating in the citywide strike include: Bartenders, guest room attendants, cocktail servers, food servers, porters, bellman, cooks, and kitchen workers who are employed at the casino resorts on the Las Vegas Strip and Downtown Las Vegas. The Culinary and Bartenders Unions have proposed new contract language to provide greater measure of security for members including workplace safety, sexual harassment, subcontracting, technology, and immigration. In addition, the Union’s economic proposal seeks to provide workers a fair share of the employers’ enormous anticipated cash flows and Trump tax windfalls. In 1984, thousands of Culinary Union members went on a citywide strike across the Las Vegas Strip and in Downtown Las Vegas for 67 days which crippled in the Las Vegas hospitality industry until contracts were settled. The last Culinary Union citywide strike vote was in 2002 when 25,000 workers packed the Thomas and Mack and an overwhelming majority voted yes to authorize a strike. The Culinary and Bartenders Unions are encouraging Nevada locals, elected officials, political candidates, and tourists to support workers by not patronizing hotels and casinos under a labor dispute. In an event of a strike, please do not cross picket lines. Las Vegas, NV - In a survey conducted by UNITE HERE’s Culinary and Bartender Unions of over 10,000 Las Vegas casino workers: 59% of cocktail servers and 27% of hotel housekeepers said they had been sexually harassed by guests, managers or others while on the job. 72% of cocktail servers and 53% of hotel housekeepers said a guest had done something to make them feel uncomfortable or unsafe. The results of the survey and worker concerns led the Culinary and Bartenders Unions to propose stronger safety protections in current contract negotiations for 50,000 workers in 34 casino resorts on the Las Vegas Strip and in Downtown Las Vegas. The contracts expire midnight May 31, 2018. Two major casino companies, MGM Resorts International and Caesars Entertainment Corporation, which respectively employ 24,000 and 12,000 union workers, have been positively responsive to the contract proposals on sexual harassment and safety buttons for guest room attendants. Union contracts covering 50,000 union workers expire on June 1, 2018 at 34 casino resorts on the Las Vegas Strip and Downtown Las Vegas, including properties operated by MGM Resorts International, Caesars Entertainment Corporation, Penn National, Golden Entertainment, Boyd Gaming, and other companies. The hospitality employees who are preparing to go out on strike after June 1 include: Bartenders, guest room attendants, cocktail servers, food servers, porters, bellman, cooks, and kitchen workers employed at the casino resorts on the Las Vegas Strip and Downtown Las Vegas. The Culinary and Bartenders Unions are negotiating new contract language to provide greater measure of security for members including workplace safety, sexual harassment, subcontracting, technology, and immigration. In addition, the Union’s economic proposal seeks to provide workers a fair share of the employers’ enormous anticipated cash flows and Trump tax windfalls. Las Vegas, NV – Members of UNITE HERE’s Culinary and Bartenders Unions have voted to authorize a citywide strike. 25,000 union members participated in two voting sessions throughout the day and 99% voted yes. 50,000 hospitality employees who are preparing to go out on strike after June 1 include: Bartenders, guest room attendants, cocktail servers, food servers, porters, bellman, cooks, and kitchen workers employed at the casino resorts on the Las Vegas Strip and Downtown Las Vegas. In 1984, thousands of Culinary Union members went on a citywide strike across the Las Vegas Strip for 67 days which crippled in the Las Vegas hospitality industry until contracts were settled. The Culinary and Bartenders Unions are encouraging Nevada locals, elected officials, political candidates, and tourists to support workers by not patronizing hotels and casinos in case there is a labor dispute on or after June 1, 2018. In an event of a strike, please do not cross picket lines. The Culinary Union, Nevada’s largest union, maintains www.VegasTravelAlert.org, a website intended as a service for meeting and convention planners and all other travelers who need to know whether labor disputes could affect their plans in Las Vegas.